Description: When Bette finds an angel coin among the money collected in a carwash, she puts it in her pocket and forgets about it. But things start to change, especially once Gabby, a mysterious and kind new neighbor, moves into Bette’s Chicago building. Suddenly, Bette is able to face some big losses—her mother’s recent death; her sister’s departure for college—and move forward. And once the angel coin falls into the hands of three other kids in Bette’s class, their lives change, too. Soon, these two girls and two boys will be connected in ways that open them up to unlikely friendships and new ways to believe in themselves. Here is an entirely new twist on the angel trend. My Thoughts: This was an excellent and touching story of friendship and overcoming adversity. Four students attend school together at a magnet school for the performing arts in Chicago. Bette has a beautiful voice but she has given up singing since her mother died in a car accident. She is lonely and doesn't have much hope for the future. Her sister has moved away to college and her dad has changed jobs from being a lawyer to being part-owner of a jazz club. He is gone all the time. When Gabi moves in downstairs, she helps Bette change her viewpoint and move on. Joe is a poor kid who attends the magnet school because it is near his home and he has to take care of his mother who has lung problems. They are poor. His dad moved to California, has a new family, and isn't good about sending the child support or providing any emotional support either. His mom tries hard though. She is developing a relationship with Gene. Joe is angry and a bully at school. The principal drafts him to work on the sets for a big school production. He meets Mike and also has his attitude changed. Andy and Vivi are twins. Andy is an excellent violinist but is also small and kind of funny looking. Joe bullies him for money each week. Until Andy turns the tables on him and just starts offering him money and friendship. Vivi is an excellent pianist but she also suffers from asthma. She is being home-schooled this year until she gets the asthma under control. She is very self-conscious because the steroids she has to take have altered her appearance. Finally, after suffering a new asthma attack because she wasn't taking her meds, she meets Dr. Raphael and begins a new treatment. The angel coin that Bette discovers in a bag of coins for charity travels from her to Joe to Andy to Vivi and may be the cause of the changes in all their lives. Careful readers may wonder if the adult helpers are angels too. Gabi could be Gabriel, Mike could be Michael, and Dr. Raphael, who helps Vivi and Joe's mother, might be the angel Raphael. Maybe even Uri -the boy who helps Vivi regain her confidence in her appearance during their Florida vacation - is the angel Uriel. 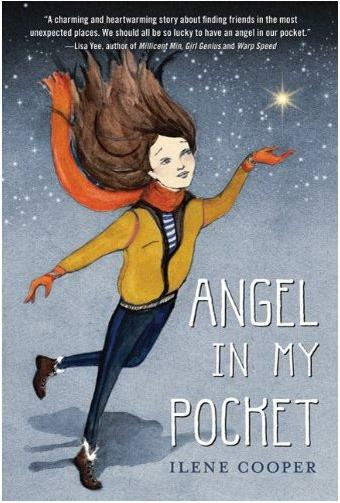 Despite the possible inclusion of angels, the book is not religious or preachy. Bette and her family are not at all religious, Joe and his mom are Catholic, Andy and Vivi are Jewish. All them are changed for the better through the course of this book. I recommend this for readers who like realistic fiction. The school day activities are well-described and the growing friendships are also realistic. Gabi pulled up an old wooden chair that Ben and Mary had left behind. Now that she had a moment to actually stare at Gabi, Bette was no longer sure how old she was. She had presumed that Gabi was about her dad's age. Now, looking more closely, she wondered wasn't much older. Her hair seemed as much silver-grey as blond, and there was something about the look in her eyes that made her think of her grandmother. Then Gabi smiled at her, and her expression was so full of expectation that suddenly she looked younger, closer to even Barbra's age.